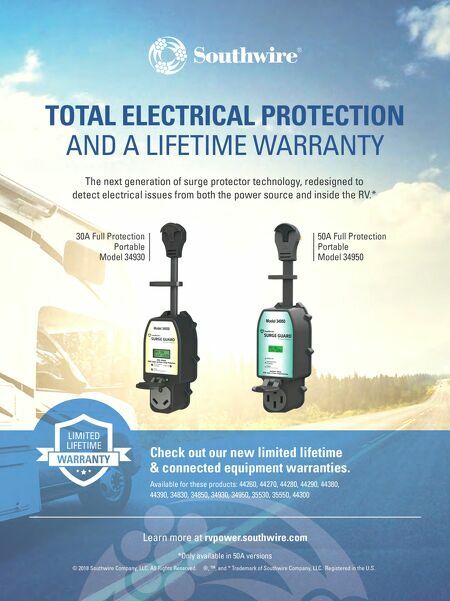 16 • RV PRO • September 2018 rv-pro.com R V M A N U F A C T U R E R S taneously on a standard 50-amp hook-up. This patented tech- nology is literally blowing us away in testing, keeping interior temperatures of units outfitted with Omni Chill an average of 4 degrees cooler in extreme heat." Keystone Springdale & Passport Springdale, Keystone's No. 1-selling brand, is adding more features and more aggressive price points across the line, says Dustin Tavernier, product manager. The 20th anniversary col- lection features a fresh new appearance with bright white and metallic gray exterior paint and linear graphics as well as lighter and more modern interior finishes. In 2019, all Springdale units will feature vaulted ceilings, pressed countertops, under- mounted kitchen sinks, glass-front door accents and power tongue jacks. Keystone's original toy hauler brand, Springdale is jumping back into this hot category with the value-priced Springdale Tailgator. Consistent with the Springdale line, the Tailgator will be conventionally built and feature a 13-foot garage, three flip- over sofas and a dual-entry bath with a radius shower connected to a queen bed master suite. Two new Springdale single-axle, Mini floorplans will be introduced in 2019 featuring slides for expanded living space. Each unit will ship at 3,700 pounds. The 2019 lineup for Passport – the top-selling ultra-lite travel trailer for the past seven years – has been completely redesigned. Product Manager Ryan Shuff reports these high- lights: an automotive-influenced ¾ cap, a new exterior graphics approach, more open floorplans with vaulted ceilings and better viewing angles for entertainment systems, new Furrion ranges with LED lighting accents, 8-cubic-foot refrigerators, seamless countertops with under-mounted stainless-steel sinks, an innovative Murphy bed design and aesthetic touches like glass-paneled pocket doors and a reclaimed wood design head- board to differentiate the line. 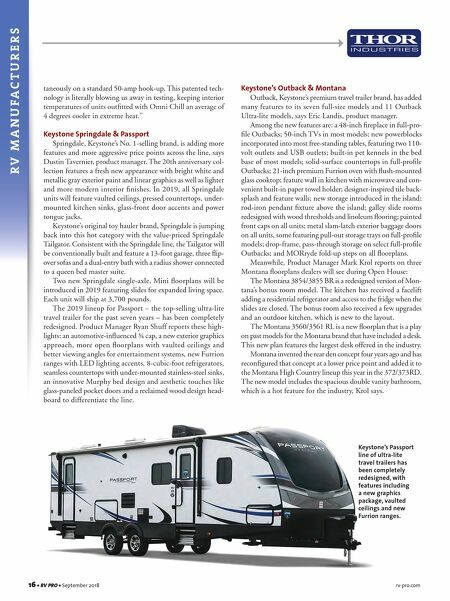 Keystone's Outback & Montana Outback, Keystone's premium travel trailer brand, has added many features to its seven full-size models and 11 Outback Ultra-lite models, says Eric Landis, product manager. Among the new features are: a 48-inch fireplace in full-pro- file Outbacks; 50-inch TVs in most models; new powerblocks incorporated into most free-standing tables, featuring two 110- volt outlets and USB outlets; built-in pet kennels in the bed base of most models; solid-surface countertops in full-profile Outbacks; 21-inch premium Furrion oven with flush-mounted glass cooktop; feature wall in kitchen with microwave and con- venient built-in paper towel holder; designer-inspired tile back- splash and feature walls; new storage introduced in the island; rod-iron pendant fixture above the island; galley slide rooms redesigned with wood thresholds and linoleum flooring; painted front caps on all units; metal slam-latch exterior baggage doors on all units, some featuring pull-out storage trays on full-profile models; drop-frame, pass-through storage on select full-profile Outbacks; and MORryde fold-up steps on all floorplans. Meanwhile, Product Manager Mark Krol reports on three Montana floorplans dealers will see during Open House: The Montana 3854/3855 BR is a redesigned version of Mon- tana's bonus room model. The kitchen has received a facelift adding a residential refrigerator and access to the fridge when the slides are closed. The bonus room also received a few upgrades and an outdoor kitchen, which is new to the layout. The Montana 3560/3561 RL is a new floorplan that is a play on past models for the Montana brand that have included a desk. This new plan features the largest desk offered in the industry. Montana invented the rear den concept four years ago and has reconfigured that concept at a lower price point and added it to the Montana High Country lineup this year in the 372/373RD. The new model includes the spacious double vanity bathroom, which is a hot feature for the industry, Krol says. Keystone's Passport line of ultra-lite travel trailers has been completely redesigned, with features including a new graphics package, vaulted ceilings and new Furrion ranges.